Everybody knows that breakfast is the most important meal of the day. It literally ‘breaks the fast’ after your night’s sleep, waking up your metabolism and helping to burn fat quicker! It gives you a better chance of losing weight and makes you more alert. But what are the best foods to really make the most of this magical morning meal? Research shows that eating two eggs in a morning (I recommend scrambled or boiled) can be great for weight-loss. Eggs contain a high amount of protein so will keep you fuller for longer. They also contain a nutrient called choline, which can improve both your nervous system and cardiovascular health. One of the easiest to make healthy breakfasts. Peanuts in the morning can increase levels of the hormone that tells you that you’re full. So basically, you will recognise that your full that little bit earlier, reducing the amount of food that you want to consume. Yipppee! Bananas keep you feeling fuller for longer so are perfect for breakfast. They are a great source of potassium, which helps to naturally lower blood sugar levels. Try on wholemeal toast (delicious), sliced onto porridge or simply eat as a mid-morning snack. 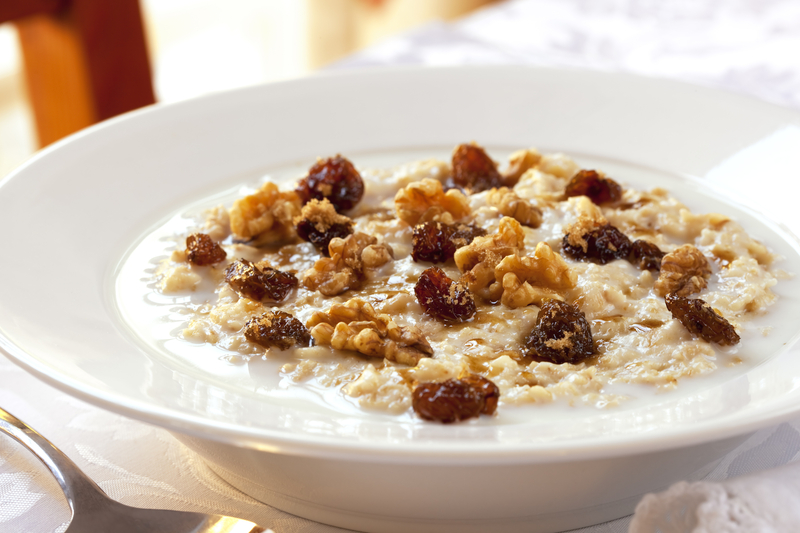 If you want to feel less hungry throughout the day, swap your cereal for oatmeal porridge. Top with fruit, seeds, nuts or a sprinkle of chia for added taste (and better Instagram pictures)! If you’re not feeling porridge or have a little bit of a sweet tooth then oatmeal muffins could be a good choice! In a rush? Grab an apple, a small amount of cheese (1-2 ounces) and a handful of walnuts and you’re good to go! A good one to eat on the move. My personal fave. Smoothies are surprisingly filling and super good for you. Experiment with your favourite fruit and Greek, natural or low-fat yoghurt. If you’re fed up of fruit, there are plenty of non-fruit green smoothie recipes out there, which are AMAZING for your health! Kale, spinach and broccoli are particularly good! Even if you’re not a huge veg fan, this could be a surprisingly great way to get you that green intake. Give it a go! Hydrating, filling and full of immunity-boosting anti-oxidants, grapefruit is a great breakfast choice. Accompany with protein (think yoghurt or eggs) for the most beneficial breakfast!